Created and designed by Baron Reichart Kurt von Wolfsheild. Coding by William A. Ware. Produced by Silent Software, Inc. for the Commodore Amiga in 1987, and released by MicroIllusions in 1988. Converted for the IBM-PC compatibles by Mark Snow. Released by MicroIllusions in 1988. Converted for the Apple //GS by Stephen P. Lepisto. Converted for the Commodore 64 by Stephen C. Biggs and Ken Grant with graphics by Les Pardew. Released by MicroIllusions in 1989. Some sources (Wikipedia and MobyGames) claim that a version also exists for the Atari ST, but none of the major Atari websites support this claim. Also, unreleased versions were reportedly made for the Macintosh Classic and WebTV. This article will not talk about those - you can find all the necessary information on Wikipedia. Let's start this month on another foot, and focus on the 16-bits for a change. 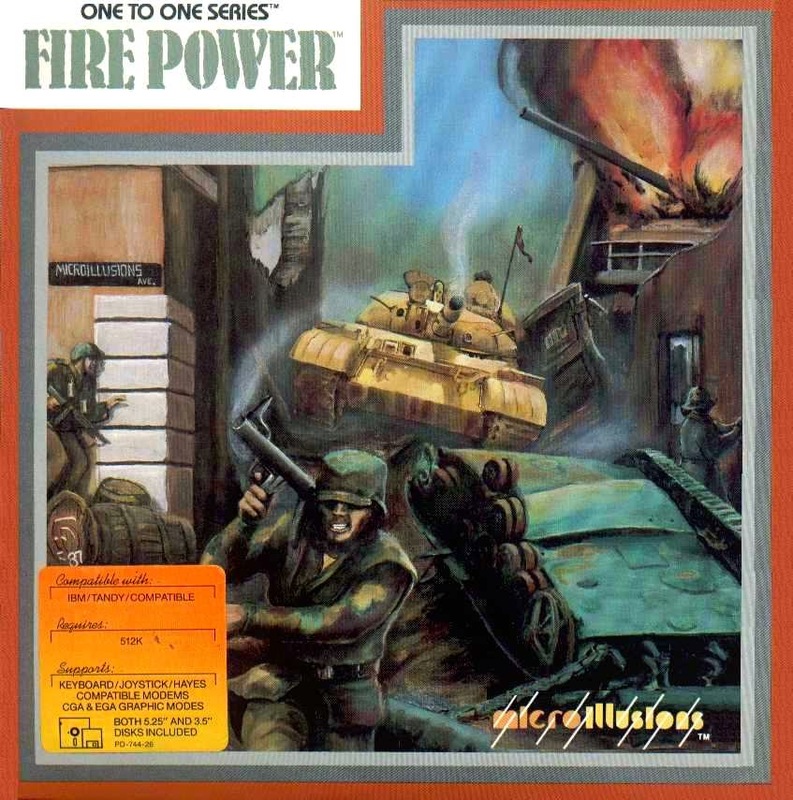 Somehow, Firepower (or "Fire Power" as it is written on the cover) was one of the most widely circulated Amiga games in my area at the turn of the decade. 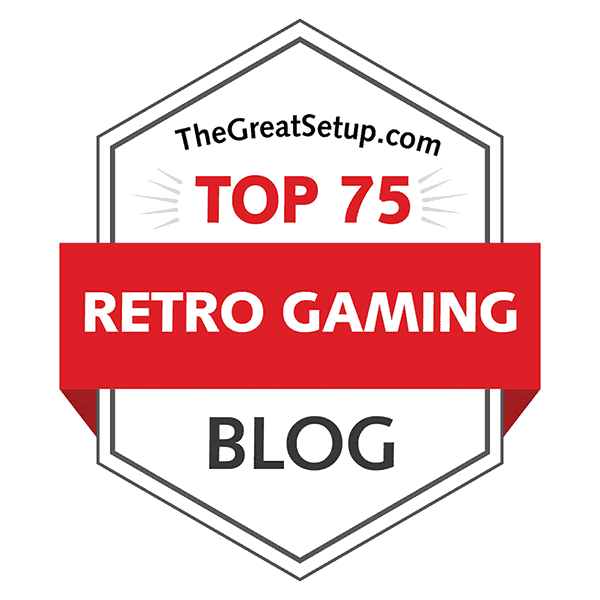 I don't think any of us ever really saw the game as anything more than a pirated copy, and it seems that most people on the internet have had a similar acquaintance with the game, because hunting down a good cover picture took more time than it has ever done for any game on this blog previously. There is one problem with the game that makes it less attractive for the collectors who collect games to play: it's basically a two-player game. Also, the game is surprisingly rare as an original MicroIllusions release for any machine, and the CDS re-releases look hideous enough that no-one but the most obsessed collectors would think of adding it to their collection. At the very base of it, Firepower is not much different from Atari's Combat, but naturally I need to be a bit more specific, just in case. We're dealing here with a top-down strategic arcade tank shooter, if that makes any sense. The gameplay consists of controlling one of three selectable tanks through a vast outdoor area with two bases for the opposing sides, blasting away buildings, turrets and enemy machinery, while also rescuing prisoners from within the enemy camp. The main objective is to capture the flag from inside the enemy base and bring it home to your own base. This sounds all fine and familiar, but there were some rather obscure features in Firepower, that weren't all that heavily utilised at the time. For one, you have the ability to run over enemy soldiers in your tank, crushing them with an accompanying "squish" sound and leaving bloody splatter around the battlefield. The game also has a map editor, which is a great addition for an otherwise easily repetitive game. The biggest point of interest at the time would have been a multiplayer mode over a modem connection, which not only allowed for real-time gameplay, but also the ability to chat online. Of course, most of us didn't have this possibility, so we would have to make do with the split-screen mode. You can also play Firepower against a computer opponent, but where's the fun in that? Today, Firepower offers not much more than nostalgia, but for a similar, if more modern gaming experience, I would recommend you less retro-driven gamers to dig out one of Firepower's sequels, both titled Return Fire. The original is still worth digging up for archeological purposes, and while it does offer a good multiplayer experience, I cannot imagine anyone prefering Firepower over any of the more modern equivalents. Regardless of your choice of controller, you control your chosen tank by moving into the direction as the tank appears to be moving towards on the screen - in other words, moving the joystick left makes the tank turn to and travel left. Of course, this means that you will go in reverse if you move the joystick into the opposite direction of where you were going previously. It's not a very realistic way of movement, nor a particularly logical method either, but at least you can align your tank in 16 different directions, which is plenty enough for this type of a game, since the non-controllable firing units can only fire in 8 directions. Firing the cannon is done simply by pushing the fire button, but dropping mines is a bit more complex - you need to stop the tank first, then pull down the joystick and simultaneously push the fire button. You need to be careful with the mines, though, since they're proximity mines and will explode when anything gets near them, including your tank. Although your main objective is to find the flag from the enemy base and bring it home, you can also destroy as much of the enemy's forces and buildings as you can while at it, as well as rescue your fellow soldiers imprisoned inside the enemy prisons. For this, you need to shoot down the prisons, wait for your troops to climb aboard the tank, then head back home and drop the cargo off next to a First Aid tent. Bringing back 15 prisoners will award you with an extra life, and after every 5 men, you are given an extra mine. Also, destroying enemy fuel depots (two differently sized domes connected) will give you some extra fuel. To help you on your way, you are given a radar, which will show you enemy troops moving near you, as well as the location of the flag, once you are getting close enough to it. What sets all versions on a similar level is that all the versions of the game offer detailed instructions, which will tell you everything you could possibly need to know of the game and how to play each version. Only the C64 version is clearly set apart from the rest by not having the ability to drop mines, although you can see them scattered around on the battlefield. And truly, that is the only great difference in all the versions. The rest of it concerns the speed of the game, which is mostly - and quite heavily reliant on your machine setup. Through emulation, I couldn't find any sort of speed that I would have been happy with on either Kegs (Apple2GS) or DOSbox, so I suppose this is one of those games that need to be played on proper hardware. Mind you, at 8 MHz, the A2GS version was the most playable of the possible choices, but also a lot quicker than any of the other versions, and it was really difficult to get into the considerably quicker rhythm of the game. That said, I suppose for anyone used to the speedy A2GS version, any of the others would be too slow, so I cannot really judge it by that alone. Nor can I judge it by the badly behaving controls, which are very likely only behaving badly because of either my choice of a controller, an emulator or a motherboard. Only the numpad seemed to be a plausible choice in any sense, but even that worked with a 1.5 second delay! Any USB joystick I tried to use would only go down and right, even though the Windows joystick calibration program showed that the joystick worked perfectly. Once again, I hope that one of you readers will help me out on this one and leave a comment if you know how the game plays on a proper A2GS. Apart from all that nonsense, there's only really the loading speeds which might affect your enjoyment of the game. On the C64, the loading times are naturally quite long, but at least the gameplay makes up for it by being surprisingly close to the Amiga. As it happens, the AMIGA version isn't much quicker to load, but it does have something else going for it. The A2GS version comes second with a rather good loading speed, and the DOS version wins easily with hard drive access speeds. I'm not entirely certain if I should be giving this lot any scores at all, since I haven't got the chance to test any of the versions out on original hardware from original disks. So, I'll make an exception until further notice, and give the scores based on my experiences of the game via emulation alone - how difficult it was to make the game run as well as it did in the end, and how playable it was with modern hardware. If you decide to have a go on your own, and come across some rather inevitable problems getting any of the versions to work, drop me an e-mail and I'll guide you through any of it. Loading/Title screens. Top row, left to right: Commodore Amiga, Commodore 64, Apple II GS. Bottom row: DOS CGA (left) and EGA (right). I have to say, even having grown up with the AMIGA version, the loading screen for it has always seemed rather blurry and unappealing to me. For the DOS and C64 versions, the same style has been retained, but the picture within the title logo has been changed enough to make it look clearer, thus more appealing. The APPLE //GS loader features a unique full screen picture, and the game title in the middle styled in a see-through frames-only kind of a font, which looks very good on its own right, but with sepia-toned graphics, it has a more WW2 feel to it than perhaps needs to be. Selecting the game modes and controllers. Top row, left to right: Commodore Amiga, Apple II GS, Commodore 64. Bottom row: DOS EGA (left) and CGA (right). After the first text bits have passed, which we have done rather literally, we get to the control and play mode selections screens. The DOS and APPLE versions offer two separate screen for these selections, because there are more controllers to choose from. The funny thing about this bit is, when you consider the playability offered by each control method on each version, it seems as if in the versions where you get less control modes, the better controllability you will get, because the focus for making the controls work is dedicated to just one type of a controller. Graphically, of course, the AMIGA and APPLE versions look easily the best here, but this is not exactly one of the more important bits to judge any game's graphics by. Credits and choice for instructions, left to right: Commodore Amiga, Apple II GS, Commodore 64, DOS. The only text screen that I could consider to be stylised in any way is the one with the proper production credits. At least, such is the case in the AMIGA and APPLE versions. On the Amiga, all the text is written on a metal plate of sorts, in a couple of different colours and two shades for both. Silent Software is highlighted with a bigger font, too. The background is a random camouflage print, which suits the theme nicely. The Apple version of the same screen looks more like a licence plate or something, and hass less colours and thematic style to it. Still, it's much better than either the C64 version or the DOS version, neither of which have anything worth mentioning in terms of style or graphics. Well, the DOS version does have stencil numbers, but that's it. Also, the DOS version has the instructions prompt as it very own screen (I added that bit under the horizontal line), and all of the credits are shown in a plain text screen before the game mode selection comes up. 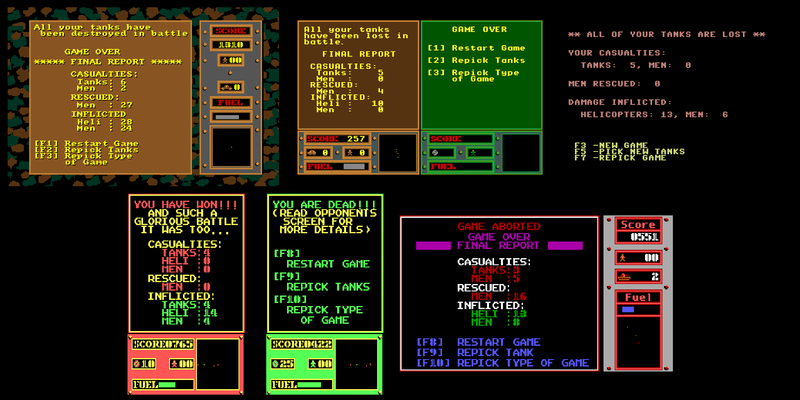 Tank selection screens for a single-player game (above) and two-player game (below). Left to right: Commodore Amiga, Apple II GS, DOS CGA, DOS EGA, Commodore 64. 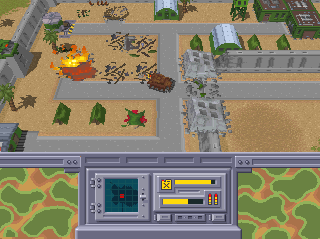 That same camouflage print background is still in this screen on the AMIGA (as it continues to be for the duration of the set of instructions, if you ever care to have a look at them), but the tank pictures and the HUD graphics look almost exactly the same on the APPLE version, which is quite interesting. Only the number font is a basic system font on the A2GS, while the AMIGA version has a Stencil-like font for everything. Even more interestingly, the DOS version uses a similar stencilized font as the Amiga version, but the colours are radically different. The tank pictures in the DOS version are not digitized from photographs, unlike the Amiga/Apple pictures are, but instead they're pixelated by hand, and the artist also drew unique background graphics for each tank, which look rather nice. The C64 tanks, of course, look considerably lower in quality, but at least the 8-bit team opted for making them look properly 8-bit, which I guess is more practical, but it's still bad compared to the others. In-game screenshots from single-player mode. Top row, left to right: Commodore Amiga, Apple II GS, Commodore 64. Here is where the differences really start to matter, of course. But the differences are of a different kind than in just plain quality of the graphics or the amount of colour. In fact, the colouring of the game is basically quite similar in all four versions, although the shading and amount of detail is understandably considerably better on the 16-bits. 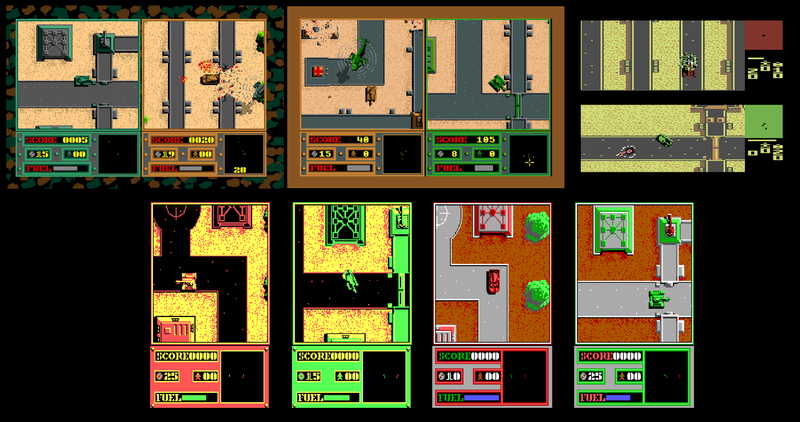 Of course, the CGA version can only display 4 colours at once, which in itself offers a surprising difference of balance in gameplay - the walls are completely covered by either of the player colours, so you can tell by the wall colour, when you have crossed the border to the enemy camp. The A2GS version shows both one- and two-player modes in a similar manner - the screen is split to have room for the other player's screen even in single player mode, even though the other screen will not be required. All the other versions give a bigger dedicated screen for the single player mode, which gives you more field of vision horizontally and vertically, and the info panel is situated on the right side in such a way as to let the action screen have a proper square shape. The DOS version has a slightly wider action screen than the Amiga version, but the colouring is a bit off due to the CGA and EGA mode restrictions. The C64 version does the job surprisingly adequeately, even if it still is easily the ugliest of the lot. Particularly the sidepanel looks horrid. But what makes it surprisingly good is the scrolling, which is rather bearable considering the sheer amount of information the machine is required to keep in memory, and it almost even keeps up with the Amiga, so well has the graphics code been optimized. Although I cannot keep it off from the last place, it's not as bad as you might suppose, and I do recommend every C64'er to have a go at it. In-game screenshots from two-player mode. Top row, left to right: Commodore Amiga, Apple II GS, Commodore 64. Apart from the obvious differences in the background and the other font, the two-player mode looks same enough on the AMIGA and A2GS. Sure, as before, there are some minor palette differences, but otherwise all the things in the action screen looks practically the same. Strangely, the DOS version has a considerably narrower screens for the two-player mode, but then again, the screenshots may give you the impression that the graphics are horizontally squeezed up a bit, which might well be true, but in the old days, one could easily adjust the screen aspect ratio by turning some knobs on the monitor, so you could make it look as wide or as narrow as you liked. Still, as it is, it's not too bad, but compared to the Amiga and A2GS, it looks a bit... thin. Here, the C64 version makes a wrong move. Of course, with its natural screen size and the way the pixels are drawn, splitting the screen horizontally instead of vertically must have seemed like the more logical choice. And sure, when you're going left or right, it works well enough, but when you're trying to see ahead or behind when going up or down, it becomes a problem when there's not much field of vision at all in either direction. Driving into mines will become a routine this way. However, even while this is a big complaint, the game still scrolls surprisingly well in two-player mode, and is quite playable. Speaking of scrolling: as I said earlier, I'm not entirely sure how trustworthy is the KEGS emulator at giving you the impression of how the Apple //GS actually works. There are 4 different speeds that the emulator can run in: 1 MHz, 2.5 MHz, 8 MHz and an "infinite" MHz. At 2.5 MHz, the game runs slower (nudges along badly) than on the C64, and at 8 MHz the game is almost unplayably quick, but it sure animates smoother. I would hazard a guess that 4 MHz would be the ideal setting for Firepower to be played in on the A2GS, but of course, I could easily be wrong here, since I've never even seen one of those things. Surprisingly enough, it's the DOS version that runs and even animates the best in two-player mode, once you get it to play in the preferred speed. Game Over screens. Top row, left to right: Commodore Amiga (SP), Apple II GS (SP), Commodore 64 (SP). Bottom row: DOS CGA (MP) and EGA (SP). SP = single player mode, MP = multi player mode. The Game Over screen consists of all the information about what happened on each side of the battle, as well as the way the game ended. You are also given three options: to restart a similar game, repick the tanks in use, and repick the type of game, so whichever option you choose, so far you will be taken in the game menus. Graphically, the Game Over screens are not any more exciting than any other text-based screen, but the DOS screens are the most colourful of the lot. I believe the above screenshots already show you enough of the overall quality of all the graphics in the game, but if you're still not convinced, you can always try them out for yourselves. I could have shown you all the different objects from all the versions in a neat but huge collage, but that's all, and I do believe it would have been futile in this case. To get a better idea of the animations in the game, you need to look at some video or another on YouTube, or better yet, play the game yourself, but I might as well make this much of a notion about them: the rest of the 16-bits look massive and stunning compared to the C64 and the CGA DOS versions. So, in the end, although the Amiga and A2GS versions look pretty similar, the single-player mode on the A2GS suffers from the lack of a dedicated single-player mode screen - the one on the Amiga is much bigger and makes for more comfortable playing. Also, unless the KEGS emulator can be proved to be so inaccurate as to make the game run worse at 2.5 MHz than it actually does, or too fast at 8 MHz, I have to assume that the game suffers from bad scrolling on the A2GS. But it does have a better looking loading screen, which can be considered its only redeeming feature in comparison to the Amiga. The DOS version has its advantages, particularly on the CGA mode, but as it's more difficult to get to run at the correct speed than the Amiga version, and the EGA mode isn't quite as natural in its colouring, it'll have to settle for third place. Obviously, the only 8-bit version takes the last spot, even if it's surprisingly good for what it is. Regardless of this comparison having been a bit questionable in quality, due to the relative lack of content and versions I have thoroughly enjoyed writing it. And it ends with another easy section, because there is no music in the game - in any version of it. Only the sounds of all kinds of destruction will make your experience complete. Yes, the game even starts with a big old explosion, once the title screen hits in. The next sounds will be heard in the action, starting with your tank's sound. All tanks have a slightly different drone, which adds to the supposed realism of it all, but once you hit any area with any sort of enemy action, the most often heard sounds are the sounds of a missile getting fired and hitting something, eventually causing an explosion. You do get to hear some nice helicopter sounds when they arrive on the screen and no missiles are being fired, but that's a rare treat. Running over people will cause a splat noise, or more like a mixture of a splat and a dull thud, as well as a nasty red puddle on the ground. And that's pretty much all that you can expect from the game, sound-wise - this concernes both the AMIGA and the A2GS versions. Naturally, the DOS version plays its sound effects through the PC speaker, which means that the sound effects are based on tricky random-sounding uses of melodic beeps in strange frequencies and speeds to make them sound not completely unlike explosions and missiles being fired and all that. It's not bad at all, considering the hardware, but it doesn't beat the proper sounds digitized for the Amiga and A2GS. Then of course, there's the C64 version, which sounds pretty much exactly like you would expect a tank game sound like on the C64. It's not bad, but it's a bit weak and underwhelming compared to the real explosions, and I'm sorry to say, even the rather peculiarly executed sounds on the DOS version. There are just enough sounds to make different sorts of missiles and explosions separate, as well as the droning of helicopters and tanks, but as I said, the overall feel of the sound effects is rather weak in comparison to the other versions. Unless you can provide me some proof as to whether the A2GS plays as badly as it seems to on the KEGS emulator, these will remain as the results. And as far as I'm concerned, this is as truthful as it'll likely get. Apart from a bad title screen, the Amiga wins this round easily, but I can still recommend you to try the game on any platform. As you already know, Firepower had two official sequels of sorts called Return Fire and Return Fire 2, originally released for the 3DO, and later also released for the PS1 and Windows platforms. The "official" status comes from having been developed by the same team who were behind Firepower - Silent Software, and the gameplay is basically the same, but the games are presented in a more three-dimensional manner. Apparently, the first Return Fire is one of the best titles available for the 3DO, so there's a nice tip for all you collectors out there. Not only that: it was also made for the Sega Saturn, but it failed to get released for whatever reason. You can read about it here, as well as see some nice screenshots. Hope you still enjoyed it, regardless of everything! Next time, I'll probably be doing some backwards somersaults while eating frozen beef jerky, unless something unexpected happens, in which case you'll be reading another comparison. Until then, make games, not war, and you can always leave a comment if you feel like it.